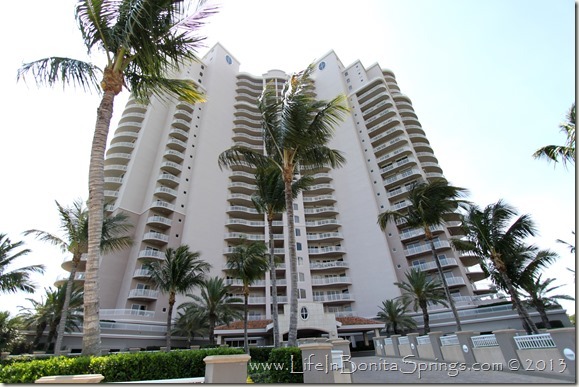 Horizons at Bonita Bay is a luxury, high rise located at 4731 Bonita Bay Blvd. in Bonita Bay on Estero Bay. Condominium homes in Horizons at Bonita Bay offer gorgeous views of the bay, the Gulf of Mexico, mangrove estuaries, Bonita Bay golf course and the community of Bonita Bay. The high rise, tower consists of eighty residences spread over twenty-four stories. Horizons was built in 2000. Individual residences at Horizons at Bonita Bay range in size from about 3,100 to 5,700 square feet of air conditioned living area with two bedrooms plus a den to up to five bedrooms, depending upon the floor plan. Interior amenities at Horizons at Bonita Bay include a beautiful club room with bar and game room for leisure activities and entertaining. Horizons also offers a fully equipped fitness center with locker rooms and massage rooms. In addition to the luxurious interior amenities, Horizons at Bonita Bay also offers out door entertaining and recreation which includes a beautiful resort style swimming pool, barbecue area and world class Gulf views. Walking paths and Estero Bay Park are conveniently located near Horizons, too. Contact Chris Griffith today to learn more about buying or selling a home in Horizons at Bonita Bay.